This info is for the Toshiba Satellite L300 laptop, but from what I read on several forums, it may be a very similar problem on other Toshiba laptops and notebooks. If you have tried pretty much every software fix from everywhere on the net and your USB ports STILL aren't working then I suspect this page will help you. Use this info at your own risk. I am not liable for any damage to yourself or your equipment by following anything listed on my website. So you need to test the voltage at the bad USB ports. It needs to be done 'under load', so the easiest way is to crack open an old USB wifi or bluetooth dongle and plug it in whilst laptop is turned off. On the back of the USB plug, you will see four connections. the outer two are power and the ones we need to test. Connect your volt meter probes to the outer connections and then turn on the laptop whilst looking at the volt meter. If you get a steady 5 volts or close to it (eg: 4.7-5.3), then this won't help. I suspect, though, that you will get an initial 5v, but this will quickly ramp down to 0 volts or close to it. A quick and dirty way to test for this voltage drop off, is to plug in any USB device that has a power LED (maybe a USB hub, or even a phone or ipod that usually charges from USB). Turn the laptop on and the LED on the device will turn on and then fairly quickly fade out. This method is not 100% as different devices behave differently, so its always best to test with a volt meter if you can. The problem is the 8 pin MOSFET power switch that controls the power to the USB ports. This chip labeled U5 for the left USB ports and U11 for the right USB ports. The chip is a G545-B1 MOSFET power switch. It has +5v on its input pins (pin 2 and 3) and bad supply at its output pins (pins 6, 7 and 8). Its output pins go directly to the USB ports. Pin 4 is the control pin (high=on low=off) and should read +3.3v. Pin 5 is open-drain output, to report over-current or over-temperature event and should read +3.3v. If you are getting correct voltages at every other pin, this confirms its bad. Supplying an external +5v to the output pins (6,7,8) proves this, as the USB ports start working as soon as the voltage is applied. The G545-B1 MOSFET chip is hard to find, but can be successfully replaced with TPS2065 (made by TI). 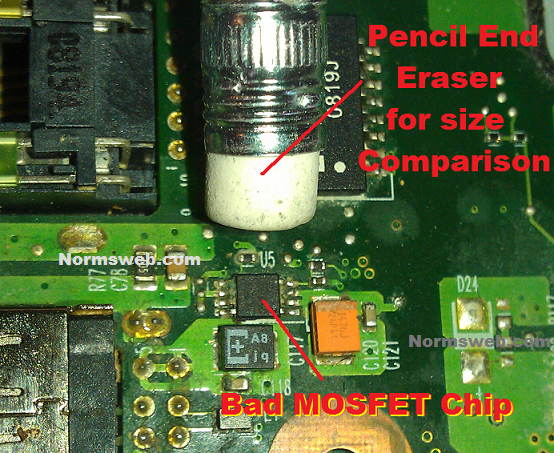 The chip is in a very tiny MSOP package, and replacing it is not an easy task (unless you have speciality tools). Even with my many years of electronics and soldering experience, it took a long time and many many uses of foul language to get it done using a standard soldering iron. Remember that if you mess up whilst trying to replace the chip, you could potentially kill the laptop. Do not even attempt to replace it if you are new to soldering. Its cheaper to pay a professional electronics engineer to replace it for you than to buy a new laptop!